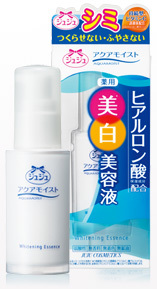 A skin softening and refining serum provides both whitening and softening effects. With softer skin, ascorbyl glucoside, a potent whitening ingredient, is quickly absorbed, going deep into the skin's layers to lighten dark spots and even out complexion. Generous hydrators restore skin elasticity, bringing back skin's youthful feel. Follow with moisturizer for a velvety soft complexion. I have this in the old packaging and it should look like this now, but I'm not sure if they have change the formula. I don't use this on a daily basis, that's why one bottle would last me forever, and what I usually do is apply this before a paper mask, and I've noticed that it instantaneously adds a huge boost of hydration that no paper mask alone could achieve, at least not the cheap ones that I'm using. I found that the Original Aquamoist Essence was more hydrating that this version, and since I don't use this often enough to notice any changes on my skin tone, I guess I won't be repurchasing.